Always Aubrey: New Blog I'm Following: Annie's Eats! Everyone knows by now that I LOVE FOOD. 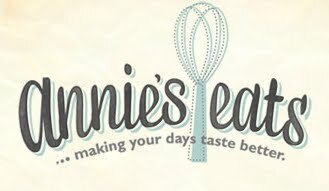 My friend ER posted a link to some peanut butter swirl brownies, and I followed that link back to an amazing blog that I cannot believe I've never found before... Annie's Eats. I was even MORE pleased to find out she's living in Indiana (Hoosier shoutout!). I dig the design and aesthetic of her blog; I'll be honest, that's important to me. I love that it's pretty to look at. The photos (which she takes herself) are drool-inducing, and I have gotten so many ideas from perusing her site. It's easy to navigate, with some great categories to choose from. She cooks a wide variety, which I appreciate; I peruse tons of baking sites, but definitely need to branch out to 'real' food. I can't subsist on cupcakes, right? The reason I'm so into food blogs is that these authors came to their medium from a pure love of food and cooking. Not only that, they're so willing to share tips, provide step-by-step photos and instructions, and answer questions that people leave. You don't get that on the Food Network website. You're lucky to see one photo of a recipe there. People like Annie are making things that seem "do-able" to me, things that I can imagine making in my own kitchen. There are times I'm inspired by Food Network or Cooking Channel or Martha Stewart, but even the ingredients aren't something I can find at my local grocery chain, let alone replicate at home. The bloggers I love the most share their triumphs, failures, and finds, and it feels like a conversation.